You have given us your Word, God, bound in a book. And we ignore it. Sometimes we use it to prove that we are right and our enemies wrong. Sometimes we use it to hide from our responsibility to your world. Sometimes we use it to avoid change and growth. We use it as a weapon. We use it as an excuse. We use it to avoid thinking for ourselves. We confess that we read what we like, and pretend that the rest is not there, Worst of all, God, we think we can keep your Word bound in a dusty book, safe and harmless. We forget that you are a God who will not be bound, a God who breaks all chains. Gracious God, forgive our narrowness and our cowardly faith. Amen. The readings for the day included Matthew 5:17-20 and Romans 3:27-31. For the last month, we’ve been coming into this room and considering what we mean when we say that the Bible “is the Word of God”. We’ve talked about how it’s been used as a weapon and how it was intended as a gift. This morning, I’d like to walk around that topic one more time as we consider how we are to approach the Bible and respond to it faithfully. As we do so, let’s consider first the witness of Jesus. If you know much about Jesus, you’ll remember that he was a troublemaker. I read a blog earlier this week that said, “in a culture where people got nervous around those who rocked the boat, Jesus danced in the canoe.” One of the charges that was frequently leveled at Jesus was that he had an apparent disregard for Scripture. Time after time he was berated for healing on the Sabbath, or for allowing his disciples to pick grain on the Sabbath, or for eating with gentiles, or for coming into contact with lepers or the dead. He had a reputation for being “soft” on the Word. So it’s not surprising, then, when he sits down in Matthew 5 and begins his epic teaching, The Sermon on the Mount, that he wants to set the record straight. He looks at his disciples and the crowd, and then he looks at the dusty old Bible, and he says, “I came to abolish the Law, not to fulfill it.” And there was great rejoicing in the land. Jesus gets it! The Law is so old-fashioned. Nobody believes in all that stuff any more. We are free to throw out the Law and do what we want. Thanks, Jesus. Yeah. Jesus, who was so often in trouble for his apparent disregard for the Law, refuses to let anyone off the hook. When Jesus showed up and began to reveal a deeper insight into the heart of God, he raised some questions. He was not bound by all the traditional readings and understandings. And, to be sure, he taught that one’s first allegiance was to him. 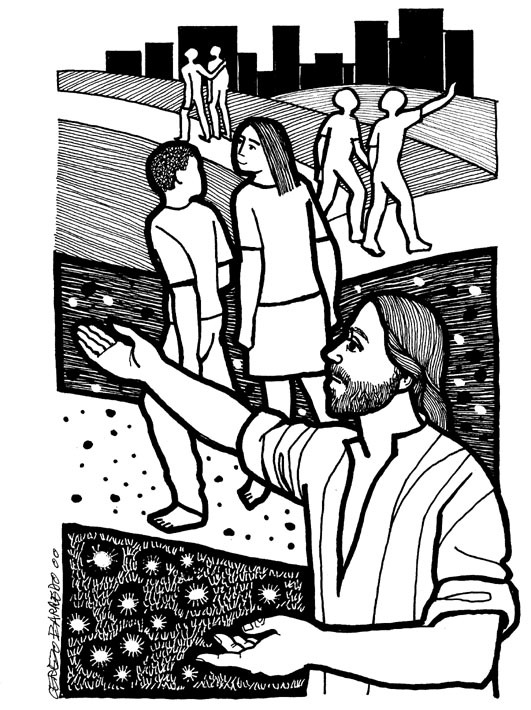 “Follow me” – that’s what he said to the fishermen by the lake; to the tax collector; to the crowds; to the sick and to the well. Jesus manifests his perfect union with the will of God as revealed in the Old Testament law and prophets. He has in fact nothing to add to the commandments of God, except this, that he keeps them. He fulfills the law, and he tells us so himself, therefore it must be true…that means that he alone understands the true nature of the law as God’s law: the law is not itself God, nor is God the law. Bonhoeffer suggests that there are those in every time and place who make the mistake of putting the law in God’s place and in so doing make the law a god and make God a law. In the Sermon on the Mount, Jesus confronted the sin of bibliolatry – the tendency to be more in love with the rules than with the One who first made them. When I first heard the term “bibliolatry”, I thought, “What’s the problem? How could anyone think too highly of the Bible?” But the truth is, people of God, that you all wrestle with this in one way or another. I know this because I’m the only person who will throw away an old Bible around this place. Every now and then there’s some raggedy old Bible laying around…it doesn’t matter how many pages have been torn out or how abused it is, you’re not going to throw it away. “I’ll let the pastor take care of that,” you say. “There must be a holy way to do it.” I’m not saying that bibliolatry is having a respect for the Bible – it’s putting the Bible in the place that belongs to God. Jesus indicated, and we’ve said during the past few weeks, that the Scriptures are God’s inspired message that allow us to see into God’s heart. The intentions of the Father are revealed, by the power of the Holy Spirit, through scripture. In saying that, though, I do not mean to imply that the Bible is given as a handbook for correct behavior. While there are any number of rules and regulations that stem from a score of different times and places, the Bible is not a catalogue of rules telling us what we can and cannot do. Rather, the Bible is the primary means by which God reveals God’s self to God’s children. Every Christian of every age is called to be diligently attentive to the Bible – but we are also called to remember that while the scripture guides us to God, the scripture is definitely not God. The scripture is a creature, not the Creator. In the past couple of weeks, I’ve struck a nerve with some folks by using an example from the 21st century. Today, I’d like to consider a conflict from the first century. The Old Testament said that following God meant being a Jew. And being a Jew meant that all males were circumcised. Jesus, as a male Jew, was circumcised. All twelve apostles, being Jewish men, were circumcised. Paul was an apostle who was sent by God to tell the good news of Jesus to those who had not been raised as Jews. He was, as a Jewish man, circumcised. 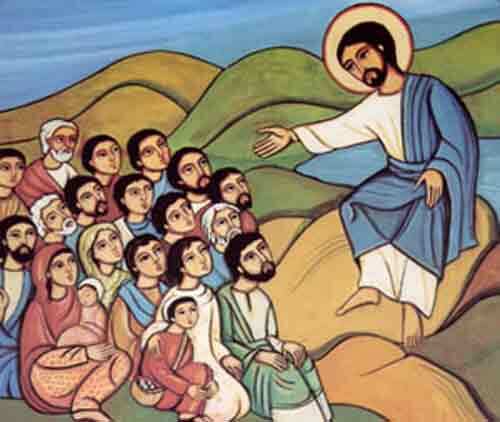 In the course of his ministry, he taught more people how to follow Jesus than anyone else. And Paul did not require people to become Jewish or to be circumcised before they became Christians. For many of Paul’s closest friends and brothers, this was simply unthinkable. It was there, as plain as day, in Leviticus 12:3. Males who follow the Lord are circumcised. You want to belong to the people of God, you play by the rules. There are no exceptions. Yet Paul taught that circumcision was an outward reflection of an inward reality. He said that it was a sign for a heart that had been changed – and that the most important thing was for one’s heart to be oriented towards God. In essence, Paul said that the law is designed to tell us who we are, not necessarily a checklist designed to tell us what we are supposed to do in any specific situation. We become a part of what once took place for our salvation. Forgetting and losing ourselves, we, too, pass through the Red Sea, through the desert, across the Jordan into the promised land. With Israel we fall into doubt and unbelief and through punishment and repentance experience again God’s help and faithfulness. All this is not mere reverie but holy, godly reality. We are torn out of our own existence and set down in the midst of the holy history of God on earth. There God dealt with us, and there He still deals with us, our needs and our sins, in judgment and grace. It is not that God is the spectator and sharer of our present life, howsoever important that is; but rather that we are the reverent listeners and participants in God’s action in the sacred story, the history of the Christ on earth. And only in so far as we are there, is God with us today also. Jesus, and Paul, and the early church all indicated that faithful discipleship is based on obeying scripture. 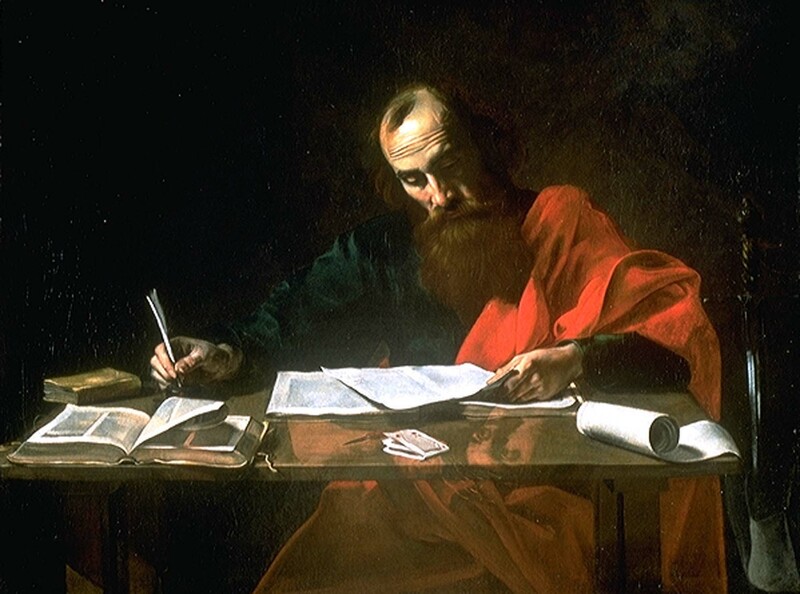 Yet Jesus, Paul, and the early church stood against a literal reading of specific laws as mattering more than understanding the intent of the law-Giver. Obedience to the Word of God means knowing the heart and purpose of God as revealed through the holy Scripture. Do you see? We are not free to take a section of the Bible, cut it out and paste it on our foreheads, our bumpers, or our policy statements, saying “this is the rule, now and forever – shut up and stop arguing.” But neither are we free to ignore it. We read it. Read it a lot. Read it as though you expect to hear an intrusive and insightful Word. Read it knowing that it comes as a gift – not just to those in the time and place where it was first written, but somehow to you and me as well, even though neither one of us owns sheep, wears robes in public, speaks Hebrew, or eats Kosher. Read the Bible. Read it honestly and humbly. W. C. Fields was a comedian who was an avowed atheist. When a friend came upon him reading the Bible in the weeks prior to his death, he said, “I’m looking for loopholes.” That approach to scripture, in addition to being impractical, limits the possibility for its impact on our own lives. When I say that we are to read it honestly and humbly, I mean that we approach it expecting that the Holy Spirit who inspired the writing of those words will inspire our own hearts as we seek to live them in our own day. 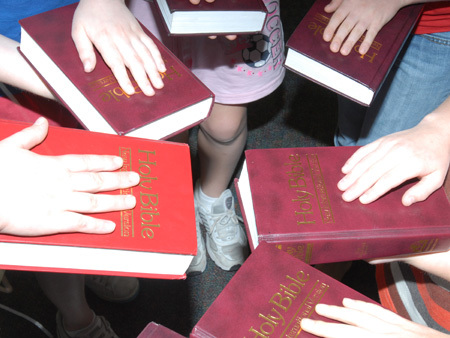 Read the Bible with other people. Here at CHUP, we have a great gift in that virtually every Sunday of the year, there is at least one group of adults who are committed to sitting together and listening to scripture during the FaithBuilders hour. Most Sundays, there are at least two or three. Coming together in a community to hear and to explore what the Bible says is one of the best ways to understand its meaning in our lives. And as you gather with others to read scripture, make sure that you include people in that circle who have a different perspective. One of the great dangers in our church and in our culture is that we are increasingly likely to listen only to people who will back up our own opinions. When I was in seminary, I took a class on the book of Romans, and in that context I wrote a 30-page research paper on a passage of scripture that dealt with one “hot button” issue in our church. I came down fairly strongly on one side of that issue. The next year, I had the same professor for a different course. When he was assigning topics and reading lists, he asked me to stay afterwards. It turned out that he was teaching the Romans course again, and a fellow student was going to write a paper on the same passage, and the professor was fairly certain that the other student would come to a strikingly different conclusion than had I. So the professor decided that he was going to make us meet together and discuss the issue. He said, “You two have spent as much time as anyone in this seminary looking at that text, and you have come to vastly different conclusions. It seems to me that it would be very profitable for you each to learn how the other arrived at your end. To give you an incentive, neither one of you will pass your class until you demonstrate that you’ve taken the chance to listen to each other.” He was right – neither one of us changed our minds, but we each grew in our ability to listen to the other, and more importantly, to see how scripture can be authoritative. When I started to preach on the authority of scripture, I mentioned that my first car was a Honda Civic that sported a bumper sticker that said, “God said it, I believe it, and that settles it.” Do you know what? Both the car and the bumper sticker proved to be too small for me. Maybe it’s a good thing that I’m driving that giant SUV now, because if I could find it, I might choose a bumper sticker that says, “God said it. I interpret it, to the best of my ability, keeping in mind the limitations and filters imposed by my worldview. That doesn’t entirely settle it. But it does provide a trustworthy – if incomplete – platform on which to base my values and decisions.” The Bible is authoritative, and it does get to tell me who I am and what I am. But it requires some work on my part, too. I am sure that on this side of the Kingdom, we will not agree on everything when it comes to the interpretation of the Scriptures. I am also sure that our agreement on social or political issues is not what binds us together. We are one in the body of Christ as we come together as His people, asking for His spirit, seeking to hear His voice in scripture and in our own hearts. Thanks be to God for the gifts of God. Amen. The Cost of Discipleship (MacMillan Paperback 1963), p. 137. As we worshiped on July 22, we continued our discussion at Crafton Heights church on the nature and authority of the Bible. Building off the previous two messages, we talked about how and why the Bible has authority, and what some of the implications for today might be. 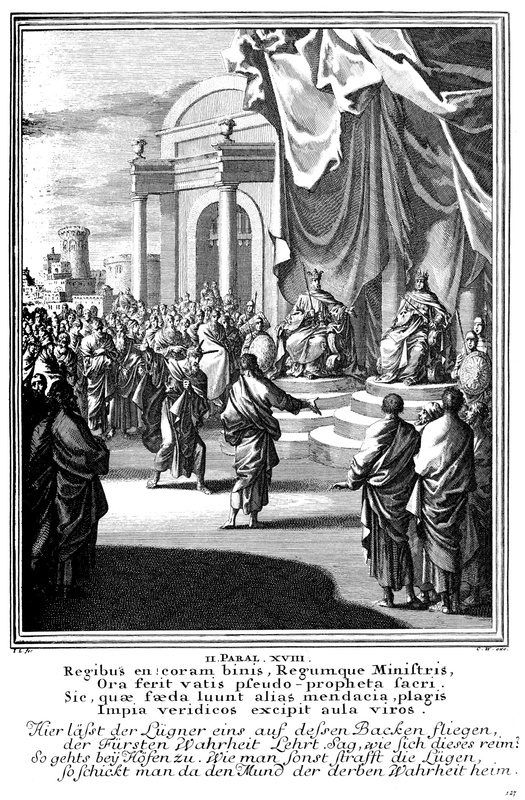 Our scripture included excerpts from 1 Kings 22 (printed below) as well as Acts 1:6-11. Well, that must have struck the G-Man all right, because my brother has been for many years a well-decorated, honorably serving member of the Delaware State Police. And he does have authority. But he knows, and you do too, that that authority is not based on who he is, necessarily, as much as it is based on the commission he’s been given by the Governor of the State of Delaware. He’s been trained, equipped, commissioned, and sent out by someone who has a great deal of authority, and in the context of that, then, he functions as an officer of the law. He has a uniform and a badge that represent the authority he’s received from someone else. I’m not so different from my brother, at least in that regard. Every week I put on this shepherd’s robe and stole, not because it’s cotton and breathes so well in the heat, but because I need a tangible reminder that nobody shows up here to listen to my opinion on anything. Any authority or credibility I have does not come from me, but rather the One who called me into the office of Minister of Word and Sacrament. Today, we continue a discussion we’ve had for the past several weeks on “how do we read the Bible?” Let me say again that I hold as truth that the Bible is authoritative. The Bible is a gift from God. The Bible contains the Word of God. Those things are true…but how do we hear and understand the Word in our world? This morning, I’d like to turn to one of the oddest stories in the Bible to help us examine that question: the story of Micaiah, son of Imlah. It’s all recorded for us in I Kings 22. Jehoshaphat says, “You bet, Ahab; we’re all in. But just to be sure, let’s check with the Big Guy first.” They consult the prophets, and the overwhelming consensus (400-0) is that yes, this is God’s Word. Let’s go smite the Arameans. 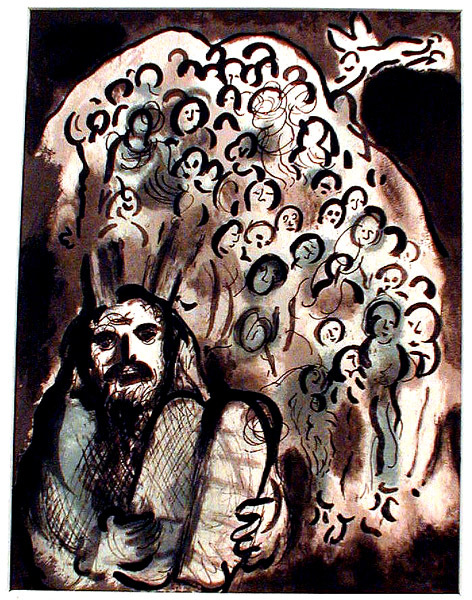 The Prophet Micaiah Before the Kings, in a 17th-18th century woodcut by Otto Elliger. 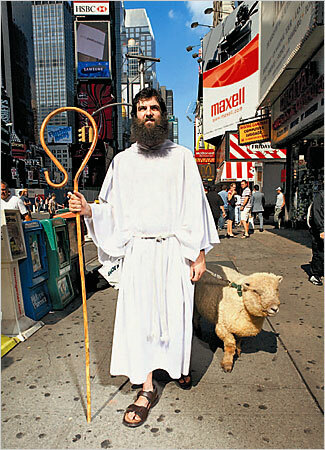 Micaiah describes a vision of sheep without a shepherd – in other words, there will be no king in Israel. God will not deliver this Ramoth Gilead into the hands of Ahab. The battle will be lost. He’s jailed, and ordered to be held on starvation rations, and reaffirms his prediction. And as it turns out, God’s judgment fell on Ahab and he died as the battle was lost. Israel was saved from a bad king, and Micaiah’s words came true. Micaiah had stood in the council of the Lord and in that private, strange, secret meeting he had learned that even the apparent scriptural authority which these prophets had, and the apparent tradition and reason, wasn’t good enough; God wanted to judge Ahab and so save Israel. And so God delegated his authority to the prophet Micaiah who, inspired by the Spirit, stood humbly in the council of God and then stood boldly in the councils of men. He put his life and liberty on the line, like Daniel and so many others. That is how God brought his authority to bear on Israel: not by revealing to them a set of timeless truths, but by delegating his authority to obedient men through whose words he brought judgment and salvation to Israel and the world. As we approach the Bible, we have to remember what we are doing, and why. Our goal is not slavish obedience to a set of rules and regulations. We are not called to memorize a set of policies or preserve the artifacts in a museum. Our goal in reading the Bible – and I hope that you will read it every day – is to seek the authority of God in Christ by the power of the Holy Spirit and shape our lives accordingly. Listen: the 400 prophets who were trying to convince the king to act were using the scriptures in a way that they thought best. Many of the people who killed Jesus did what they did because they thought that they had scripture backing them up. 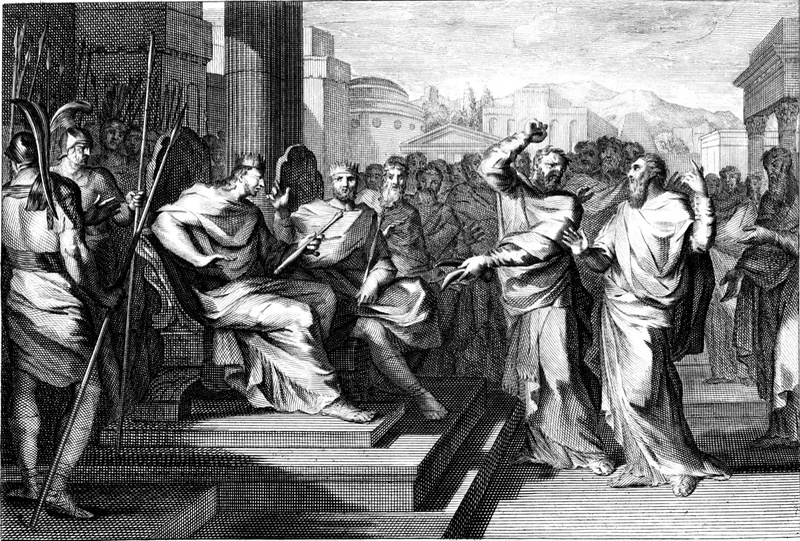 When Saul was running around killing Christians, he was convinced that he had to do it, based on his understanding of scripture as the Word of God. But the 400 prophets, and the people who killed Jesus, and Saul were wrong, weren’t they? They knew a lot of the words of Scripture…but they totally missed God’s intentions. Doesn’t that just stink? Wouldn’t life be so much easier if all we had to do was refer to the handy-dandy scorecard and check off the appropriate little box? When I was learning to read the Bible, I used to think that it told a story in four chapters: the Creation, the Fall, the Redemption, and the Consummation. I used to think that the story was all there. But to turn once more to Wright, I wonder if maybe I had some of that wrong. He suggests that there are five acts in this drama of the Universe. The first four have already taken place: Creation, Fall, Israel, and Jesus. The fifth act began with the church of the New Testament and continues to this very moment. The story hasn’t ended yet, and it appears as though we have a role to play in it. Just as the church of the New Testament took material from the first four acts and adapted and improvised with it (it’s ok to skip the kosher meals; don’t worry about the sacrifices; steer clear of meat that’s been offered to idols; and so on), so we, too, are called to live in our time paying faithful attention to the God who is the source of all authority and the people to whom we are sent. The call of the people of God, it seems to me, is to continue to act out and enflesh the story of God’s word. We build on the first four and a half chapters and keep telling the story as best we can. I just finished re-watching The Lord of the Rings trilogy. It was an amazingly rich retelling of JRR Tolkien’s classic tales. Let me ask you this. Suppose that Tolkien wrote The Fellowship of the Ring, the Two Towers, and the first thirteen chapters of The Return of the King, but then he got hit by a bus and left us all hanging around Mount Doom? If we had gotten that far into the story, we’d want an ending, right? What happens to the hobbits? Where does Aragorn end up? Does Samwise ever get to marry Rosie? We want to know the story. We have to know it. So what would we do? Would it make sense to take some of the people who knew JRR Tolkien the best, along with those who had studied his works and perhaps taken his classes, and give them the first thousand pages that were already done and ask them to finish the story in a way that made sense with what had been written already? 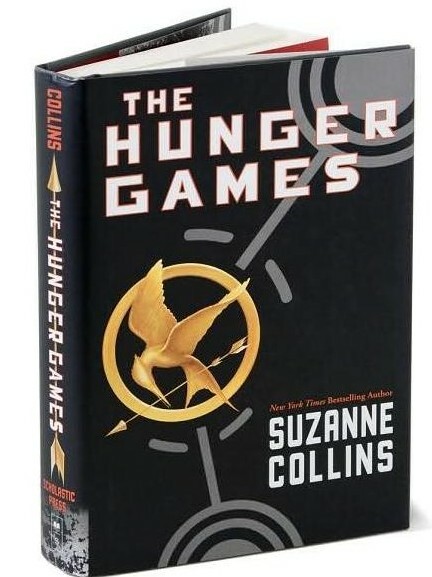 The first two and a half books provide a structure and a direction for the story – but not everything. Anyone who would attempt to write the ending would have to be bound by what had already occurred, right? You couldn’t go back to the beginning and simply decide that Bilbo never gave the ring to Frodo, or that Gollum was an Orc wearing a disguise. Anyone wanting to continue the story would have to start with what’s been given, even as they developed the story to its resolution. Could it be, my friends, that this is where we are in relationship to the Word of God? All of chapters 1, 2, 3, and 4 are written. Much of chapter 5 is done. But we have got to figure out how best to live with and represent the authority of God in Christ by the power of the Holy Spirit. For three weeks, some of you have been hoping that I’d stand up here and say that gay marriage or texting while driving or the war in Afghanistan is either blatantly against the Bible or the best thing since sliced bread. I’m not going to say any of those things today. The fact is that the Bible as we have it never once mentions gay marriage, texting while driving, or the war in Afghanistan. It doesn’t mention the fact that I expect to receive a paycheck in a week and a half, or that my 1998 Volvo is getting pretty beat up. But somehow, I’ve got to respond to the all of the realities of my world using the wisdom that comes from Scripture and the ultimate authority that resides in God. The task for the church in our age and in every age is to listen for the God who spoke in the past and who speaks today and, like Micaiah, to submit to that God. We are in the final chapters of the story, and we’re called to live them. If someone came up to you today and said, “Well, I’ve just read the Bible, and evidently, we’re supposed to go and smite some Arameans today”, you’d probably think that they had it wrong. Even though that’s all right there in chapter 3 – God’s people are smiting Arameans. But we can’t simply go back and re-read parts of chapters two or three and pretend that the story hasn’t progressed. Yet we’re not free to ignore those chapters, either. We’ve got to act within them even as the story develops. So let me please ask you to be that council of Godly people who will help each other discern how best to hear and tell the story in our day. Like Tolkien’s friends, family, and students, can you be the ones who study the stuff that’s come before and who try to get to know the Author in the hopes that we will know how and what to do in the days that are yet to come? The Good News is that God gives us, by the power of the Spirit, the Bible to guide us through the decisions and challenges for each day. If it is to be authoritative, it will be so because we engage it seriously. Your charge, no less than Micaiah’s, is to use the gifts of God. To be bold. To be courageous. To be humble. To be willing to take a stand, and be willing to accept the consequences of that stand. And to hope that we are right, trusting in God as the source of all truth and authority. God bless you as you live this chapter. Amen. All scripture is from the NIV. As we worshiped in Crafton Heights on Sunday 7/15/12, we continued our exploration of how we read and hear the Bible as the Word of God. The scriptures for the day included Deuteronomy 6:4-9 and 2 Timothy 3:10-17. Did anyone see this news article that came out of Tennessee earlier this month? 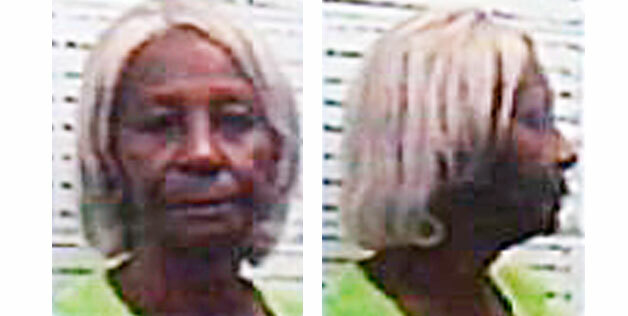 A woman named Ina Garrett was arrested in church after she repeatedly whacked her pastor over the head…with her bible! (see the shocking video here!) Do you see why I like to put the words on the screen? You can’t hit me with that… Anyway, according to news reports, Ms. Garrett and a number of other members of the Mt. Zion Baptist Church in Selmer, TN are upset with some of the preaching from Pastor Leon Taylor, and so she took the Word into her own hands and let him have it. I don’t know what a news producer is thinking when he or she runs that story, but I would imagine that most of the culture who views it responds by thinking “what a bunch of religious whack jobs”. And really, it is ludicrous to think of using the Bible to attack someone else. Until we think about that for a moment, and realize how often, in fact, we Christians do that very thing. Last week, we read from Hebrews 4:12, and recalled how the writer of that passage says that God’s word is like a two-edged sword. That reminded me of times when I was younger, and as a part of youth group or Sunday School, we’d participate in “sword drills”. The leader would stand in front of the room and bark out a passage: “John 3:16!” The first person to find the passage and start reading it would get points or a prize. It was a good way to learn where the various books are in the bible. It was not necessarily a good way to learn how to read the bible. The implication of the “sword drill” is that the Bible is a collection of statements, rules, truths, and beliefs – and each one is applicable to a particular situation. I know that I’m mixing my metaphors here, but that kind of thinking reflects the notion that the Bible is like a quiver full of arrows, and the job of the believer is to select the right phrase or passage for the right situation and just let it fly. The problem is, of course, that too often we reach into our quiver of verses and pull out one and shoot it off, not realizing that we’ve just taken it out of context or compromised the richness of the text under the guise of faithfulness or holiness. Of course, in other societies, the view is even more strident. I’m thinking particularly of those faith traditions, both within and outside of Christianity, where the need to hold to one true aspect of the faith is so important that it is actually one’s duty to kill anyone who does not believe the same things that you do. But I’m pretty sure that nobody in this room is walking around with a pocket full of rocks to fling at an adulterer, and that nobody believes that someone should be killed or attacked for having a different (or no) belief structure. 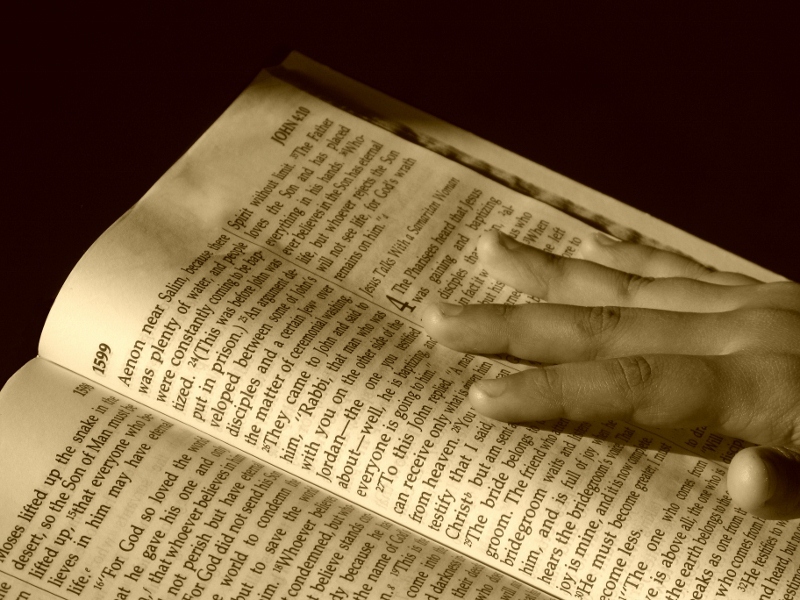 I want us to revisit the topic that we raised last week, namely, how do we read the Bible? Is there a “right way” to approach and use scripture? We read 2 Timothy and we agree – yes, all Scripture is inspired by God. For many of us, the more we love God, the more excited we are to open his Word and to think that God might have a word for us! And we read the bible and we search it and we fall in love with it…and then, oddly enough, the trouble starts. When we didn’t know the Bible, we didn’t care. But when we started to love it, we realized that you and I see it differently, and we begin to quarrel over who has the correct understanding. N. T. Wright is one of the leading New Testament scholars of our age, and he has said “It seems to be the case that the more that you insist that you are based on the Bible, the more fissiparous you become [I had to look it up – it refers to an organism that breaks into increasingly smaller units]. The church splits up into more and more little groups, each thinking that they have got Biblical truth right.” Surely we have seen a great deal of this in the North American church over the past generation. We fall in love with our own notions of which parts of the Bible are the most important and we wind up using those parts to attack those who disagree with us. The problem is that when I do that, I do violence to scripture. 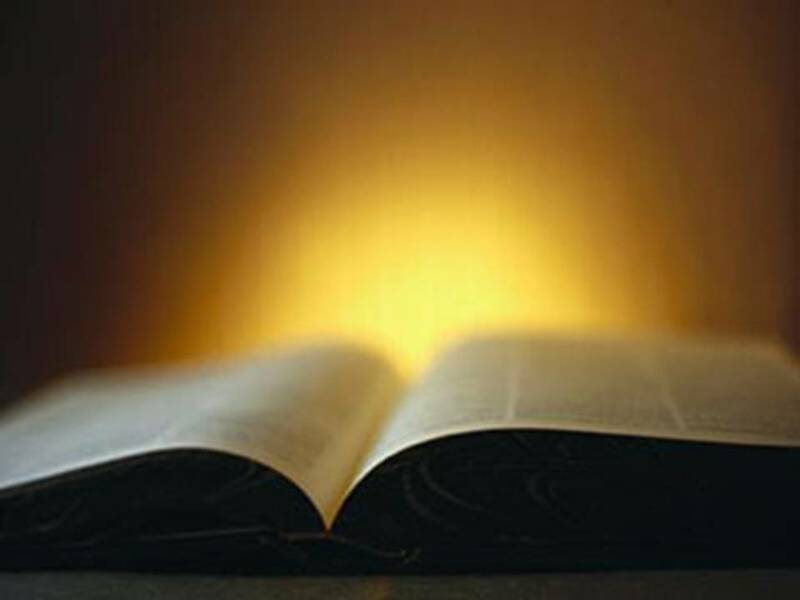 Leviticus, Jeremiah, Luke, and Acts – none of those writings individually, and surely not together as the Bible are a rule book, or a systematic theology, or a creed. They are, as Wright and others point out, narrative. That is, they tell a story. 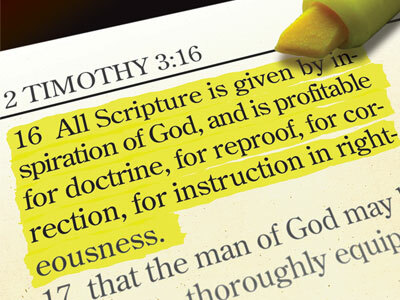 When I see the Bible as my tool for correcting all the wrongs in the world (or in your life), and I pull out my favorite proof-texts to show you how wrong you are, I am misusing the gift of God’s word. Let’s go back to Deuteronomy, when the Story was young. How does the Author say we are to treat this Story? As God’s people who hear God’s word today, we need to recognize and perhaps reclaim these truths. The first word is LOVE. The first intention, for all of us and for each of us, is to honor the God who speaks those words in our lives and in our behaviors. We keep and teach and bind and write the words because we love the Speaker. 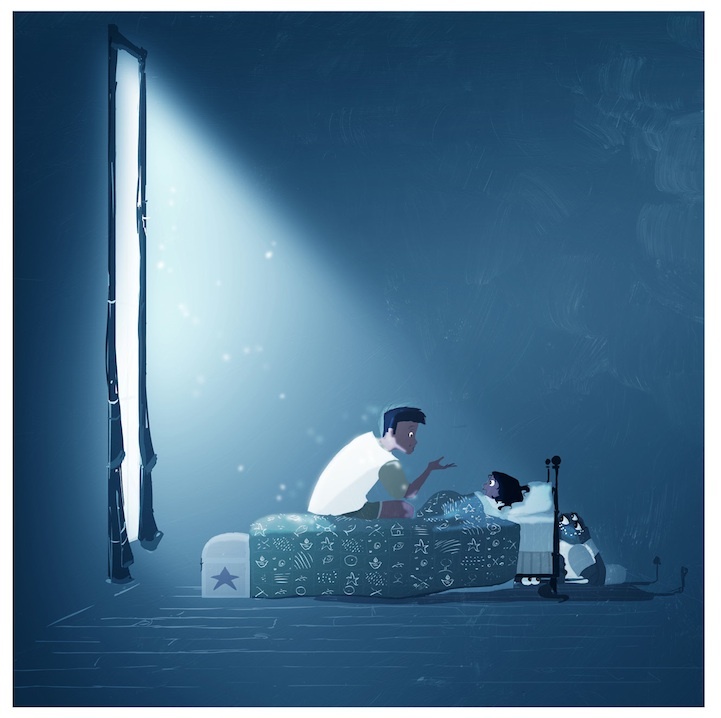 Listen: when my daughter Ariel was a little girl, I tried to tuck her in most every night. And many of those nights, she would ask for a story. The most frequent stories that showed up in those days were what Ariel and I came to call “Crazy Eddie” stories. A “Crazy Eddie” story was always improvised on the spot. My daughter would say, “Daddy, can I have a Crazy Eddie story tonight?”, and I would almost always say “yes”. Sometimes I would ask her what it should be about, and sometimes I’d just take off. Almost always, those stories used the character of Eddie to point to some sort of truth. Eddie is “crazy” in the sense that he’s a fool or a knucklehead. He’s crazy because he doesn’t treat his friends right or he can’t pay attention to what is important or he can’t learn from his own mistakes. In telling these stories, I often drew from events of Ariel’s own day, or from her life, or from my life. I would take an incident, such as a fight at school or a scare in the neighborhood or a misunderstanding with a friend, and I would try to help her see that incident in a new light. I would try to help her see herself in the context of a greater world and most importantly in the context of a family where she was loved and treasured. Why did I spend hours talking through stories about Crazy Eddie with my little girl? Because I thought that I was the next Dr. Seuss or Mark Twain, and that I was developing a wonderful literary tradition that would shape the world for generations? Hardly. Did I do it because I wanted her to remember every detail of those stories for the rest of her life? Of course not. I’d be surprised if either one of us can remember details of any single Crazy Eddie story. And I sure didn’t to it because I was trying to sneak a set of rules into her life. I gave her the Crazy Eddie stories because those stories and that time was a way for her to get to know a little bit about the author of those stories. I gave them to her because she needed to grow up knowing that while she was (and is) many things to many people, the first and most important truth about her is that she is beloved. She has a place in my heart that cannot be shaken. And if she goes out the next morning into a world a little more convinced of the fact that she is loved and that she matters and that she has a place, then perhaps the situations she encounters will be a little less frightening and disorienting to her. The purpose of the Bible, I believe, is the same thing. The Word is uttered so that you can have a glimpse into the heart and mind of the Speaker; in the strength of that glimpse, then, to live confidently in the reality and reliability of the Speaker. My goal with Crazy Eddie was to help Ariel face the day knowing that there were unwise people in the world; that there would be lots of mistakes, plenty of pain, and a good bit of laughter. Each day would bring something new and different. But if she dwelt in the meaning and purpose of the Crazy Eddie stories, she would know that there would never, ever, ever be a day when she would have to enter the world unsure of her daddy’s – or her Heavenly Father’s – love for her. There are some difficult questions that we face. And we must rely on the Bible to help us decide how best to live in these confusing times. As more than one of you pointed out to me this past week, lots of times there is a right. And there is a wrong. And an important part of how we get to knowing which is which comes from reading the Word. All of that is true, and we’ll get some more about that next week. Today, what I believe to be the most important Word of the Lord for us is this: that the Bible is God’s gift. It is God’s story. We receive it with love. We live into it with trepidation. If we try to use it as a weapon, we destroy both it and us. If we hold it as a treasure, we know not just the Story, but the Author. Thanks be to God for the Word of God. Amen. As the Presbyterian Church (USA)’s General Assembly left Pittsburgh, God’s people gathered in Crafton Heights on July 8, 2012 to worship and think and pray about the ways that our large “family” had come together – and the ways that we still had some work to do. One of the key issues before each and all of us is how we read and interpret scripture. Some thoughts, rooted in Psalm 119:105-112 and Hebrews 4:12-13. When I was about 8 years old, my grandparents moved in with us. There was a lot to be worried about, from an adult perspective, I suppose. Grandpa had cancer and was dying by degrees. Mom and Grandma had to figure out how to share a kitchen. There were, I might say, differences of opinion as to disciplining the children – differences that my 8-year-old-self exploited to his own advantage. I’m sure that there were economic factors, too. But do you know what? None of that mattered to me. I got to see my grandma and grandpa. 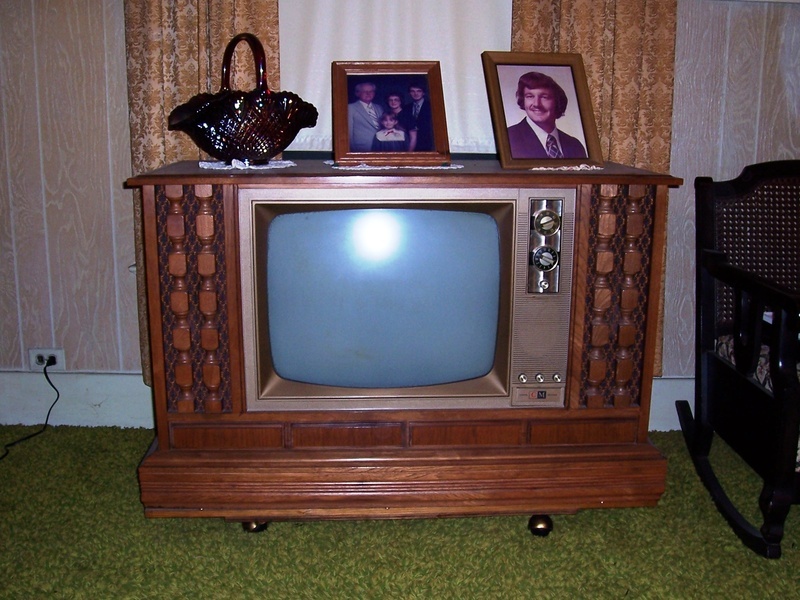 And even more overwhelming to me was the fact that grandpa had a color TV with a remote control. It was the first time in my life I’d ever seen a television picture that looked like my world – the colors were amazing. It was in grandpa’s room, and so I spent a lot of time with him…watching the Philadelphia Phillies play on green, green grass wearing their bright red caps. It was magic. I suppose that the younger version of me would say that I depended on the Bible to be the truth from God, and that every word in it was inspired by God, and that every word in it was true. Listen to me before you hear anything else this morning: I depend on the Bible to be truth from God. I believe the Bible is inspired by God. But I have come to see that the Bible is essentially written in color, not in black and white. The Bible is a complex collection of writings from dozens of different people that was collected and developed over hundreds and hundreds of years. It is at best simplistic, and at worst disingenuous, to suggest that all we have to do with any issue at all is just “see what the Good Book says” and do it. Think for a moment about how you read the Bible, or at least how you believe that the Bible should be read. Is your Bible like a cookbook? I love cookbooks. They are so precise and so predictable. I know that if I take a cup of this and a cup of that and a teaspoon of these other things, mix it for just the right amount of time and then bake it at the right temperature that I’m more or less guaranteed to have a safe and delicious result. With a cookbook, a cup is always a cup, and 350 is always 350. 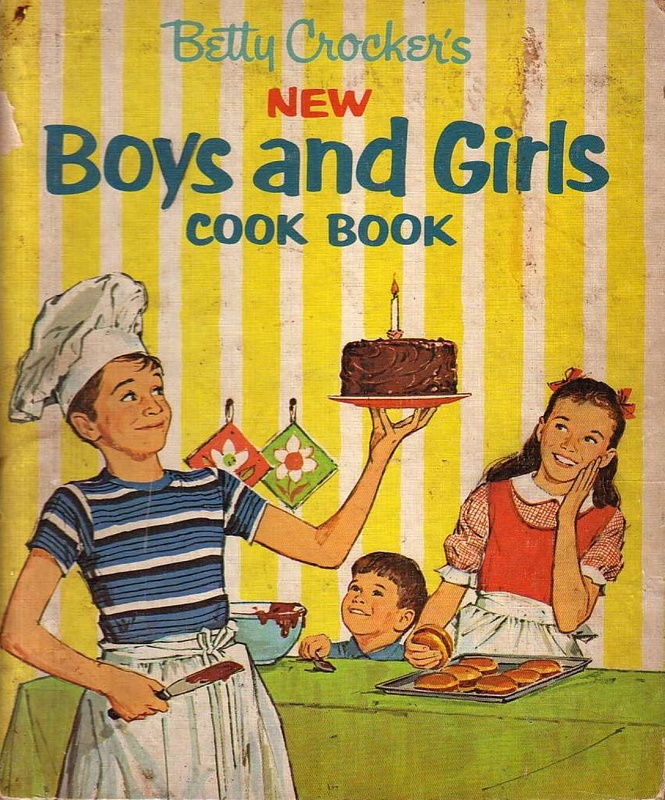 There’s no funny business in a cookbook. Or would you say that you treat your Bible like a text book, where you look for the right answers in the right places and study hard, knowing that you’re expected to do well not only on the pop quizzes that each day will bring, but on the final exam that you know is coming? There are some who treat Scripture like a novel – an amusing or even inspiring tale; a story worth remembering, but lacking in authority, truth, or reliability. We read it as a diversion from “real life”, or as an inspiring story, but not really connected to who we are. The problem is, of course, that the Bible is not a cookbook, or a text book, or a novel. The Bible is in a category by itself. It is sacred writing. When we use shorthand, we often say that the Bible is the Word of God, although if I were being completely honest I’d prefer to say that the Bible contains the Word of God. That is, I do not think for a moment that the power of the Almighty can be contained in these bits of ink and paper, but that somehow these words help me to receive The Word that brings life. I’m pretty sure that’s how the Psalmist felt. Sometimes when we consider a Psalm in our morning worship, I ask you to read the entire Psalm just so we maintain the context. Since this Psalm is 176 verses, we’re not going to do that this morning. But let me tell you a little bit about this piece. There are 22 letters in the Hebrew alphabet. Psalm 119 is a tightly constructed acrostic poem, wherein the first 8 phrases all start with Aleph, the first letter of the alphabet. 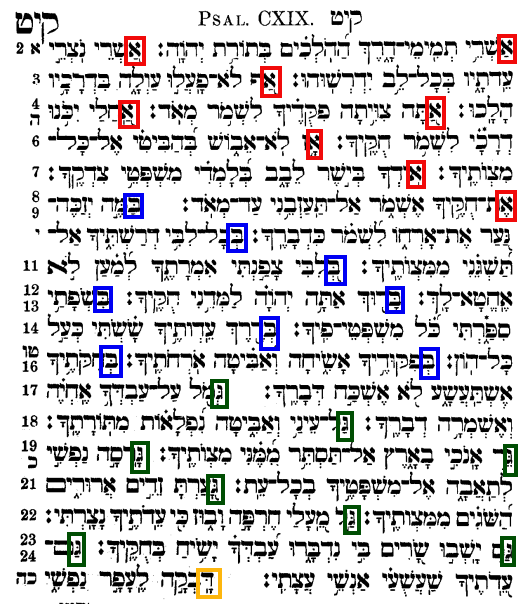 The next 8 all begin with Beth, then 8 with Gimel, Daleth, and so on, all the way to Taw. Each of these 8 verse stanzas is an ode to the power of God’s law or God’s Word. If you take the time to read it, as I hope you will, you’ll discover that the writer of this Psalm is delighted by the thought that God would actually speak to his children. In the section that we are considering today, for instance, he says that the Word of God is like a torch or a flashlight – God’s word is that which helps the writer get to safety and health, in spite of the fact that there are obstacles and snares along the way. I have spent some time this week thinking about the ways that the Scriptures are like a flashlight for us. Consider this: what is it about flashlights that makes them valuable to us? I mean, I have a number of wonderful lamps that I like to have handy in case there’s a power outage or I have the chance to go camping. How do I assess their worth and their usefulness? By how much light they produce, right? When I buy a can of paint, I’m buying the thing that is in the can and using that thing to accomplish a purpose – to protect or beautify. But when I buy a flashlight, I’m not actually buying what I really want – only the hope of getting what I want. I’m not buying light for the power outage; I’m buying a device that I hope will provide me with the ability to find light when it’s dark. To put it a different way: the Bible does not actually contain joy or hope or life; but the Psalmist says that with the help of these words, he can see hope and joy and life better. The words on the page are not the source of those things: God is. But through God’s gift of the Word, we are able to realize those gifts of God in a deep and rich way. The Psalmist also says that the word of God is authoritative: that is, the Bible is a trustworthy and reliable witness on which we can rely to make the judgments we need to make. The Psalmist says, and I agree with him, that God’s Word gives us a standard, or more accurately, a set of standards by which we can measure our lives. Hear me: the Bible is accurate. The Bible is true. The Bible is authoritative. But the words of the Bible cannot be taken from the pages on which they are written and simply plastered over our own lives and experiences. It is dangerous and unhelpful to pretend that we, or anyone else, can take the Bible literally. So much of what is recorded for us in the Scripture is, of course, God’s word for all people in all places at all times. In I Timothy, for instance, the Apostle Paul writes to his young friend and tells him to “pursue righteousness, godliness, faith, love, endurance, and gentleness.” (6:11) It’s easy to think about that as God’s word to me and to you, right? That seems to be a universal truth – a command. Yet the apostle also tells Timothy that since he has a touchy digestive system, he should stop drinking water and drink more wine (5:23). Can I use that verse say that we should tear out the water fountains in the building and replace them with wine dispensers? I’m not sure that would hurt our attendance, but it is pretty easy to see that that command, far from being universal, was more likely a specific suggestion made to a specific individual at a specific point in his life. God is not commanding you to drink more wine. Sorry. Do you see what I am getting at here? 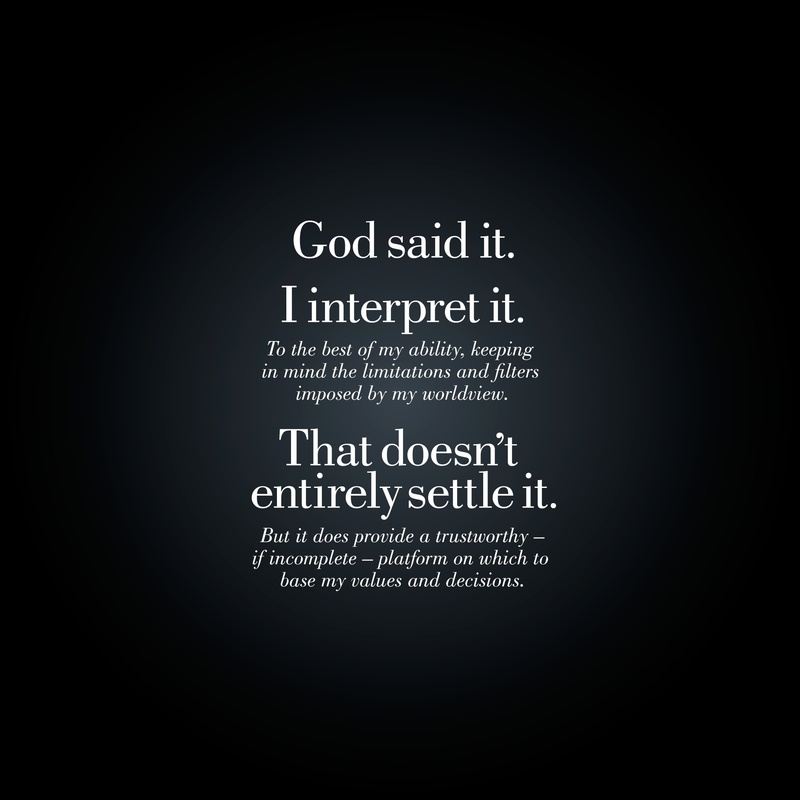 It’s not helpful for me to simply say “Such and such is wrong because the Bible is against it” or “I have to do thus and so because the Bible says I have to”. The fact is that while the Bible is a book comprised of ink and paper and glue, the Word of God is alive. Isn’t that what the Word says about itself in the reading you had from Hebrews a few moments ago? God’s word is alive and active! 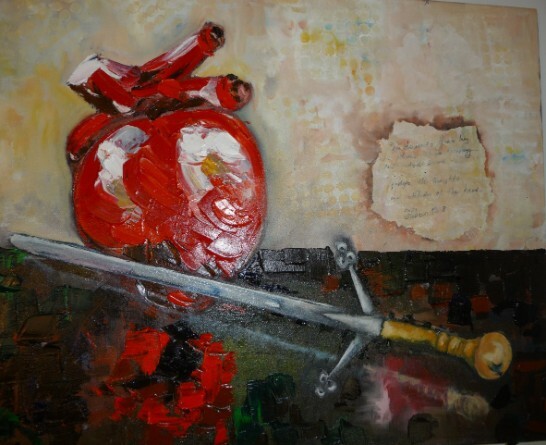 Whereas the Psalmist compares the word to a light for a path, the writer of Hebrews says that it’s also like a sword that’s been sharpened on both edges – that is to say, it will cut both ways. God’s word contains power and authority, and we attempt to contain or domesticate it to our own peril. One of the most important theologians of the 20th century was a German named Marcus Borg. He said that it is the task of every believer to “read the Bible seriously, but not literally.” I believe in saying this he was indicating that we are on equally wrong if we reduce the Bible to a checklist of do’s and don’ts that are rooted in another place and time or if we simply dismiss the Bible as a fairy tale that has no relevance to our lives today. The Bible is important, and it has meaning, purpose, and authority. But it requires us to engage it and to wrestle with it. Friends, the reality is this: I know good and godly people who believe that marriage is to be restricted to one man and one woman. And some – not all, but some of these friends have arrived at this conclusion because they have sought the heart of God in prayer, in scripture, and in study. And I know good and godly people who believe that marriage is a kind of relationship that is open to two people – including homosexual people. And some – not all, but some of these friends have arrived at this conclusion because they have sought the heart of God in prayer, in scripture, and in study. Listen to me: I do not want to talk about marriage – straight or gay – this morning. I am simply bringing that up because it’s been plastered all over the papers and it provides a helpful insight into what I’m trying to say: as people who love Christ and who long to be obedient – as I hope we all do – we are obliged to do our best to listen for the Word of God whenever it comes to us. And it’s possible that we simply might hear things differently. John Calvin, probably the most influential man in the history of Presbyterianism, reminded people that since the Bible is the Word of God, it depends on the Spirit of God to make sure that the message is received. Calvin taught that the Spirit of God was at work in the men and women who wrote the first copies of the biblical passages; the Spirit of God was at work in the lives and circumstances of the people who preserved those copies and those stories over the years; and the Spirit of God must be at work in each of us if we are going to be able to understand and truly hear the Word of the Lord in our lives. I don’t know what’s ahead for the Presbyterians in terms of any of the issues that we’ve discussed or argued about in the past week. I trust that God does. My deep concern, beloved, is that as we learn to talk about issues that are potentially divisive and undoubtedly complex, that we will do so in a way that honors and respects the authority of the Word of God and relies on the presence of the Spirit of God – the God who was, and who is, and who is to come. Let’s talk. Let’s disagree. But as we do so, let’s remember that God speaks, and we respond. Let us remember that God does have a word for us. God’s word starts and ends with Christ. So let us listen to it and for it and act within it. Thanks be to God! Amen. On Sunday, July 1, 2012 the good people of Crafton Heights were blessed to host a group of visitors from the Presbyterian Church (USA)’s 220th General Assembly. This is the highest deliberative body in the PC(USA), and about two dozen folks took time out on Sunday morning to hop on a bus and come on over to beautiful Crafton Heights. The scriptures for the morning included Numbers 11 (included below) and Luke 10:1-2. You know, you send a guy on vacation, hope that he gets a chance to rest, maybe clear his head a little bit, and come back ready to help lead worship and be a good pastor. You might have expected a lot of things, but you probably didn’t think that I’d come back and make you find the book of Numbers in your bible. When I mentioned to my pastor’s group that I thought I’d be preaching from Numbers 11 this week, I got more than a couple of looks that indicated that I’d spent too much time in the Southern Hemisphere and maybe my brain froze a little in the New Zealand winter. But hey, here we are. As the world around them changes, the people long for familiarity. They were happy to get out of Egypt and escape slavery, but as time goes by, they appear to be willing to trade some freedom and their future for the so-called security that they miss. So they cry out – they begin to weep and wail. And, of course, they direct this at Moses. What a very curious part of the reading! Did you hear what it said in verse 10? The Lord became angry, and Moses was “troubled”. Remember, Moses and God have been talking to each other for a long, long time. It’s been decades since the burning bush, and the writer here makes it sound almost like they are an old married couple who is bickering and they can’t even decide who is more angry about what. The Lord, presumably, is angry that the people were despising the gifts of freedom, promise, and daily provision. God had delivered them in all kinds of ways, and these folks are complaining about the menu. Moses, on the other hand, is more explicit. He shakes his fist at the heavens and says, “I hate it when you do this. Why is it all on me? I can’t do this by myself. This call, these people, that promise – none of it was MY idea!” And the Lord responds by telling Moses that help is at hand. 24 So Moses went out and told the people what the Lord had said. He brought together seventy of their elders and had them stand around the tent. 25 Then the Lord came down in the cloud and spoke with him, and he took some of the power of the Spirit that was on him and put it on the seventy elders. When the Spirit rested on them, they prophesied —but did not do so again. The Spirit comes upon the 70 and the two who are inside the camp. Those people, most of whose names we do not know, are called to prophesy. That is, they are called to tell the truth about God to God’s people. Most of these people are men and women who Moses saw and identified as leaders, and who had been asked to come to the leadership retreat outside of the camp. 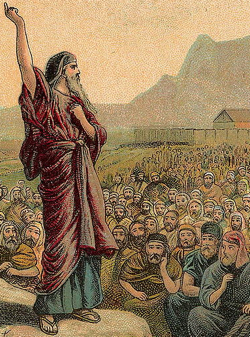 But a few were not in the group that Moses saw as likely candidates. Doesn’t matter. They all prophesy and tell the truth. They had never had the chance to do this before, evidently. And they never did again, at least in this public sort of a way. But on this day, at this meeting, at this key juncture in Israel’s history, they listened for the voice of God and spoke truth to the people around them. 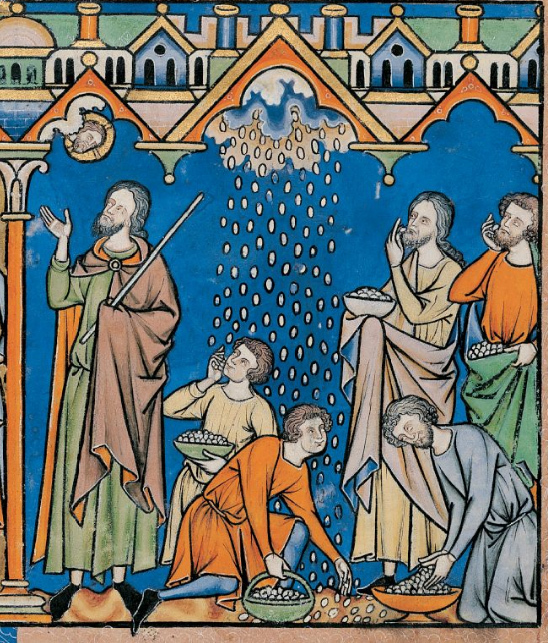 The chapter ends with a description of what happened next: a wind (or maybe it was a spirit – the word is the same in Hebrew) blew into the camp and first dozens, then hundreds, then thousands, and finally millions of quail covered the camp. There were so many that they literally piled up on the ground. There was more meat than people could have ever imagined, and some people literally ate themselves to death. Why preserve this story? Out of all the stories that could have been told about the people of God, why did this one make it into the Bible? Well, I can’t be sure, of course, but it seems to me that there are a few things that are brought out here that need to be remembered by God’s people in each generation. First, this speaks clearly to the notion that it is God’s intention to preserve for himself a people. God does not leave the Israelites where they are; God refuses to leave them where they’d like to be, and instead, calls them to a place that is even better than they can imagine. This story is a clear example of the ways that God is not finished yet. In addition, this passage is a helpful reminder that God provides leaders who will seek God’s best and tell God’s truth. Note that a wide variety of people are invited to participate here, but almost all of the people who wind up exercising the office of leadership at this place would not have sought that role for themselves. One further point that this passage makes is the truth that when given half a chance, we human beings will choose what will kill us. We turn our back on that which sustains and end up devouring that which in turn, devours us. You know, hundreds of years later, the Son of God wanted to invite humanity into a deeper understanding of what it meant to follow God, to belong to God, and to participate in the kinds of life that God longs to give to his people. 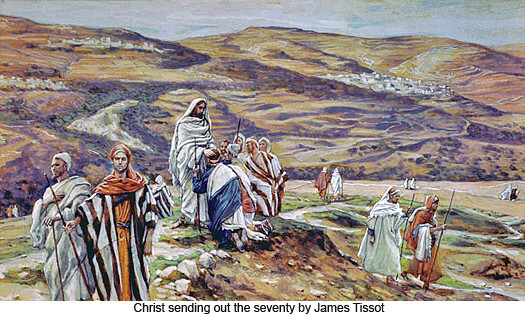 I do not think that it’s by accident that one way that Jesus chooses to do this is by sending a group of 70 (some translations indicate that it was 72) into the neighborhood in order to tell the truth about God’s kingdom. It does not appear as though any of these people have been trained as prophets or rabbis or teachers; they are simply trying to follow Jesus and are willing to do what they can to point to Jesus’ place in the world. Just as the 70, or 72, in Numbers, these people are giving themselves to God, and they wind up seeing amazing signs of God’s presence and provision in the world. And now, hundreds of years later, the people of God are once again in a time of transition. I’m not merely talking about the fact that a smallish group of Presbyterians have gathered in Pittsburgh to argue about a few points of theology and practice. The culture and the world are changing; no less than the children of Israel wandering in the desert, we know we are not in the land where we were born, and we wonder where we fit. Yeah. I was glad that it was a 12 hour flight. What would you have said? I mean, how are we – the people in this room this morning – supposed to respond to a church that is in conflict with itself as well as to a culture that is increasingly convinced that the church is either irrelevant or completely disconnected from the core purposes of Jesus Christ? I have three ideas this morning. We pray. We pray that God, who is responsible, will honor God’s own intentions of preserving a people, providing leaders for those people, and saving ourselves from ourselves. That means that I think you ought to be spending some time today and this week praying for the people who are in town as commissioners to the General Assembly; it also means that you ought to be praying for the people who are sitting next to you. Like the 70 or 72, Most of these folks are not people who have seen themselves as “prophets” before, but find that they are in a world full of people who have a hard time believing that there could be a word from the Lord. Pray not only for the church, though. Pray for Casey, and for the millions of others who have a hard time seeing Jesus these days because something, or someone, in the church keeps getting in the way. Pray. And Listen. Part of prayer is listening to the Word that God might put into your own heart. What is the heart of God saying to your heart, in your life, in this place, today? And be ready to go. Do you realize that every day you are sent out with the message of hope and love in Jesus Christ? A few of us, from time to time, are sent to a big meeting every other year, where we actually realize that prophetic call once in our lives. Most of us, though, are sent to an office, a church camp, a grocery store, or a front porch. And each of us – no less than those that Jesus sent out two thousand years ago – is called to speak truth and to speak love. And we are called to speak these things with humility, realizing that while I am not where I used to be, and I am not who I used to be, I’m not where I’m going to be, and I’m not who I’m going to be. We have to be ready to go, because we are all being sent. You know, as we landed in L.A. and headed off to our connecting flights, I gave Casey my card and asked her to come by the Heights. I think that she will. What are you, crazy, Dave? She’s a 21 year old college kid from Southern California. She lives in Colorado, and has recently moved to and from New Zealand. She’s never been to Pennsylvania. What makes you think she’s going to show up in Crafton Heights? I’m telling you, Casey is coming here. Soon. It might not be her, exactly as I remember her. She might not be a woman. 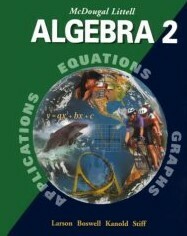 Or 21. She might not be from Colorado or New Zealand. But I can guarantee you that by God’s grace this week, you will meet a whole lot of Caseys – people who long for the church to be the church so that they can see Christ and maybe understand the fact that he has embraced them since before they were born. She is coming, beloved. She will be here. And I wonder what we’ll do, by the power of the Spirit, when we recognize her. Amen.